The 60-756 combo input/output SnapCard alarm expansion module combines the capabilities of the 8-zone input and 4-output SnapCard expansion modules. 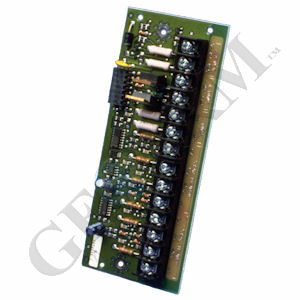 The 60-756 SnapCard is compatible with GE Concord, Advent and SuperBus 80-zone input/16-zone output expansion modules. The 60-756 SnapCard includes one 12V, 2-wire smoke detector loop that provides power (100mA) to Style B (Class B) smoke detectors. It also has (3) supervised UL fire-rated hardwire loops (2k ohm EOL resistors required) that can be used for any hardwired alarm sensor. Finally, the 60-756 SnapCard provides (2) "Form C" alarm contact relays. The relays are controlled by a alarm touchpad or a combination of states and events in the security system programming menu. When your GE alarm control panel receives an alarm event from a smoke detector attached to the 60-756 SnapCard, the alarm control panel briefly interrupts power to the smoke loop. The smoke detectors then reset and recheck for the alarm event.